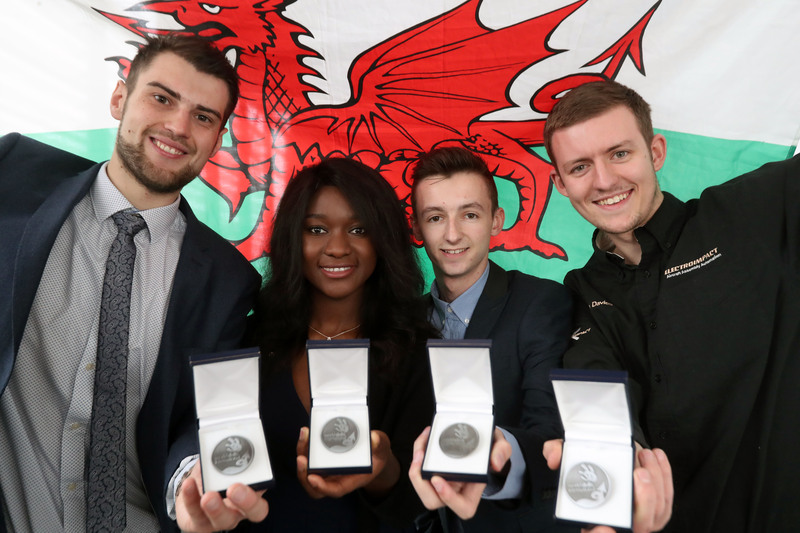 Welsh competitors selected to represent the UK in the world’s largest international skills competition have been recognised for their achievements at a celebratory event in the Senedd. Four members of Team UK, who will travel to the WorldSkills final in Abu Dhabi this October, along with one of last year’s EuroSkills Squad members, were presented with gold and platinum medals of recognition at the event, which was also attended by Dr Neil Bentley, Chief Executive of WorldSkills UK. Joseph Massey, 23, from Coleg Cambria; Ethan Davies, 21, from Mynydd Isa; Alfie Hopkin, 18 and Elizabeth Forkuoh, 20, both from Llanelli, attended with their families, tutors and employers to celebrate the success of their achievements in a range of industries including CNC Milling, Restaurant Service, Web Design and Aeronautical Engineering. Nathan Jones, 20 from Neath was also awarded a gold medal in recognition for being selected to represent the UK in the web design competition at EuroSkills in Gothenberg last year. Joseph Massey, who will be competing in the Aeronautical Engineering competition in Abu Dhabi, said: “WorldSkills has already been one of the most exciting and difficult challenges I’ve ever taken part in, and I know the standard at the world final will be extremely high. I’ve learnt so much from taking part of the competitions, and it’s helped me progress in my career, in particular it’s helped me understand how the aircraft engines I manufacture can be maintained and fixed. Commenting on the event, Minister Julie James said: “Developing skilled people is vital for our economy and we are committed to raising skills standards across the board in Wales. Each of these young people are a credit to their industries, demonstrating world class talent and I am delighted we have been able to recognise that today. Welsh competitors make up over ten percent of Team UK which shows the calibre of talented young people nurtured by colleges, employers and parents across our country. Gold, silver and bronze medallists, who competed in the Skills Show in Birmingham last year, were also invited to a celebratory evening event at City Hall, where WorldSkills champion for Wales, Barry Liles, awarded medals to the young people as well as recognising their employers, tutors and families, who offered support and encouragement.